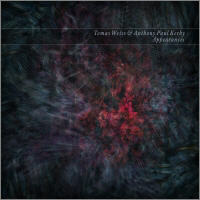 "Appearances" by Tomas Weiss and Anthony Paul Kerby is their second collaborative composition, building upon the solid foundations of "Distant Shadows" from Spring 2011. This new work forms an uninterrupted story of images and visions varying from bright expansive spaces to mysterious dark grounds, wind-swept caverns, and pools of pure emotional depth. "Appearances" is an immersive, expressive ambient release that is both lush and timeless, and will certainly reward enthusiasts of deep listening. Tomas Weiss, creator of El Culto, has teamed up with Anthony Paul Kerby, aka APK, to offer an album like very few others, in all the time I have been listening to Ambient music. This duet has left me astonished of their amazing handling of technology, which allows them to create soundscapes so beautiful, sometimes spatial, and sometimes very abstract. The point is that they manage to create an atmosphere deep enough to look at the stars, while knowing that the depth of outer space is infinite; this first production, called “Distant Shadows”, fascinated me from beginning to end because I think it perfectly encompasses the Ambient spirit and subtly embraces it. "Distants Shadows" offers to the listener a moment for contemplation, a journey through deep thoughts and a unique excuse to admire the things that keep the universe in order, but it requires a lot of attention, mental and auditory ability in order to understand the complex sound structures, and spiritual predisposition to navigate through the waters of the abyss. "As it goes: changing the order of the numbers does not affect the sum. A few months after their first release, "Distant Shadows", the second fruit of Anthony Paul Kerby and Frankfurt-based producer Tomas Weiss (who meanwhile came out with his first solo album „Dato“) has already matured. "Appearances" is a new, fifty six-minute long stream of consciousness and an inner journey in the presence of natural landscapes, rigid and inscrutable. If "Distant Shadows" could be seen as a fascinating play of shadows and thin air, behind which one could occasionally behold the blinding light of the icy north, "Appearances" is a constant and tranquil flow in the darkest night, mirrored from time to time on the black surface of an iceberg. Whereas the two opening movements introduce the obscure view from a distance, "Vision 3" is the ultimate dive in the unabashed arctic silence: a droning flow that is unceasing and impalpable, above which germinate short and precious harmonic openings and digitally processed choruses (another change, compared to previous work). Hints of melody that are only premonitions: "Vision 4" dissolves every sketch into an enchanted and pure cosmic air, and it’s like looking up at the vault, turned starry all of a sudden and feeling almost in tune with the solemnity of the scene. The magic, however, breaks down quickly and here we are again, in the fifth track, in front of the severity of immutable nature. A few, scant notes of piano momentarily catch the listener unprepared, before the icy monolith which is "Vision 7", appears in front of us: twelve minutes of floating ice sheets, frictions and crackles amplified from the thin surrounding air. Probably the peak of the artistic philosophy of the two composers. Nevertheless, the listener's attention remains firmly focused on the sound impulses and impressions for the duration of the whole: the polar night ends without any striking solution, lying in the catharsis of "Vision 10".